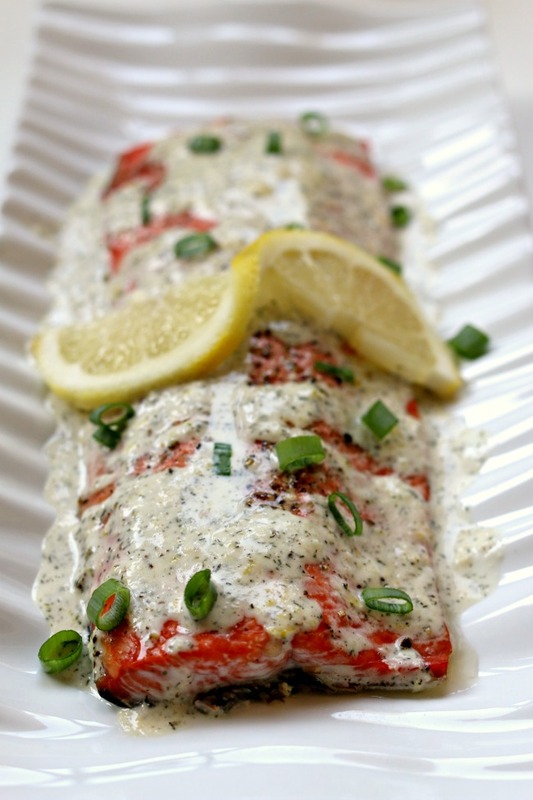 Roasted Salmon with Creamy Garlic Lemon Sauce–flaky, tender Alaska salmon with a zesty lemon garlic mayonnaise sauce drizzled on top. A super fast and easy recipe that tastes like it belongs in a fancy restaurant. When I visited my sister a few weeks ago she made the whole family dinner. We were served some potatoes with the most tasty sauce on top of them I’d ever eaten. It had fresh garlic and lemon zest in it and it was just out of this world amazing. I decided that this particular sauce would be spectacular served over salmon. I was right! This is probably the best salmon recipe I’ve ever eaten. You must try this soon!!! Oh and guess what it is SOOOO easy. View the video below to see how easy and non-intimidating this recipe is. 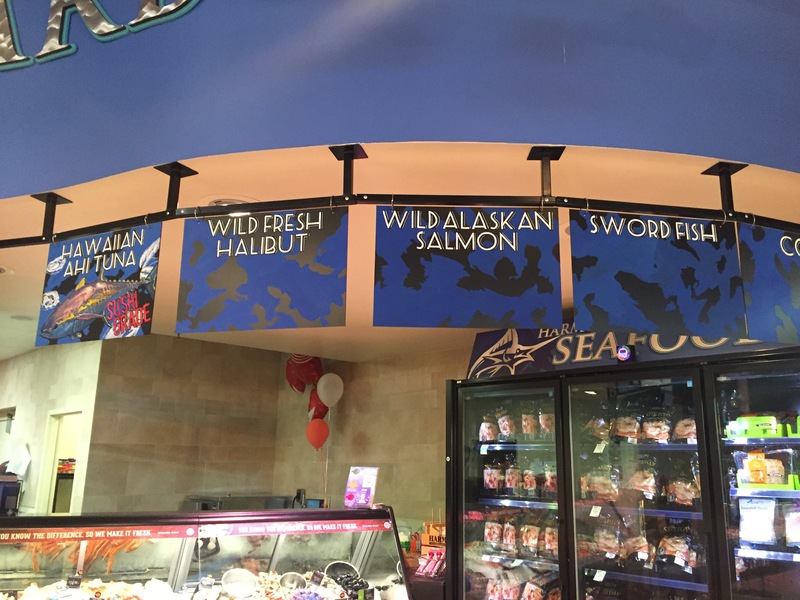 The first thing you need to do is head to your local grocer and pick out some wild Alaska salmon. My grocery store had some in the frozen section but I opted for fresh this time around. I made sure to ask the fishmonger if the salmon was from Alaska and it was. I always ask for Alaska when buying fish because any species of Alaska seafood you eat is sustainably caught and wild, including delicious Alaska pollock, salmon, crab, halibut, cod and more. I went with Alaska sockeye salmon. 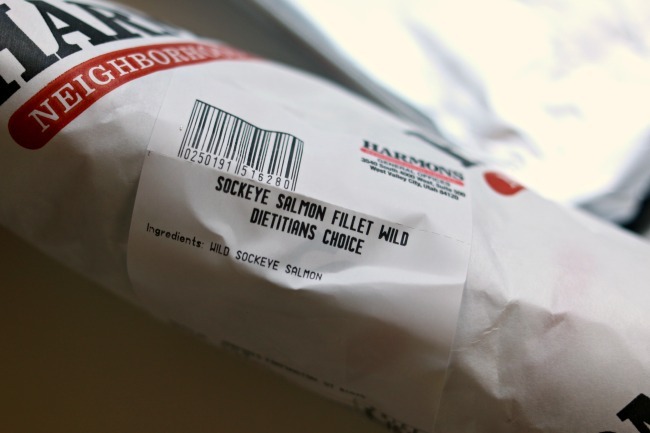 Alaska sockeye is known as red salmon because it has a deep red color. It has a rich salmon flavor and a firm texture. The texture makes it perfect for grilling, broiling, roasting, etc. It is – available fresh from mid-May through mid-September and frozen year-round. Salmon tastes so good this time of year! There are so many healthy and fresh ways to prepare salmon. Make sure to celebrate Wild Alaska Salmon Day on August 10th. I know I’ll be looking for ANY reason to make this recipe again. My family certainly won’t object either. 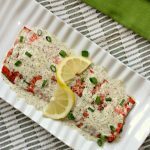 Visit wildalaskaseafood.com for hundreds of Alaska seafood recipes, cooking techniques and tips. You can also find additional information on each Alaska salmon species, nutritional values and harvesting methods. 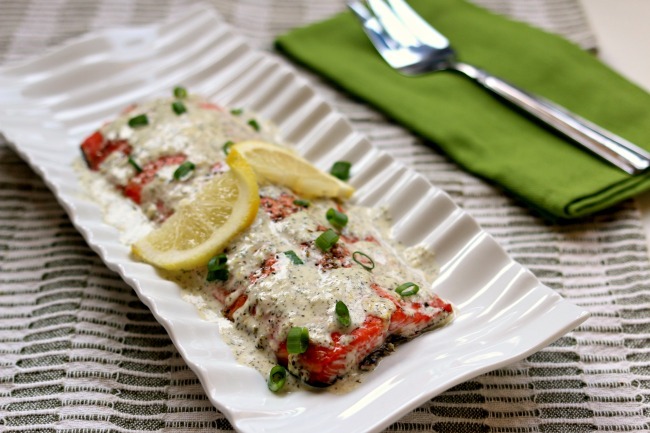 Flaky, tender Alaska salmon with a zesty lemon garlic mayonnaise sauce drizzled on top. A super fast and easy recipe that tastes like it belongs in a fancy restaurant. Preheat your oven to 375° F. Place salmon on a parchment or foil-lined baking sheet, skin side down. Lightly brush the salmon with olive oil. Lightly salt and pepper the salmon. Bake in your oven for 12-15 minutes, depending on thickness of salmon filets. Insert an instant-read thermometer to make sure the middle of the salmon filet has reached 145° F. Remove the pan from the oven. 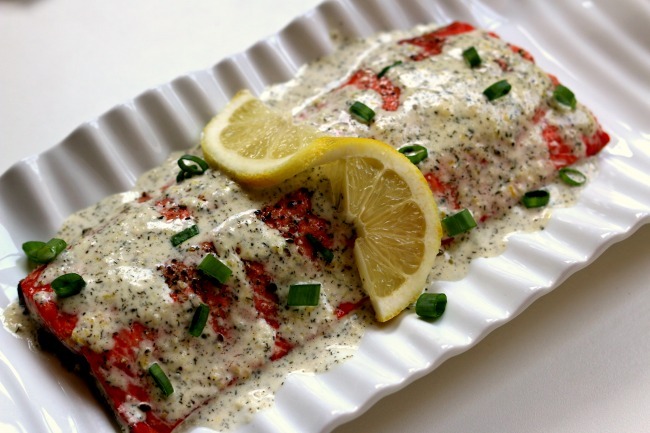 While salmon is baking, add mayonnaise, garlic, lemon juice, zest, salt, pepper and dill to a blender. Blend until combined. Drizzle the sauce over the cooked salmon filets and eat and enjoy! 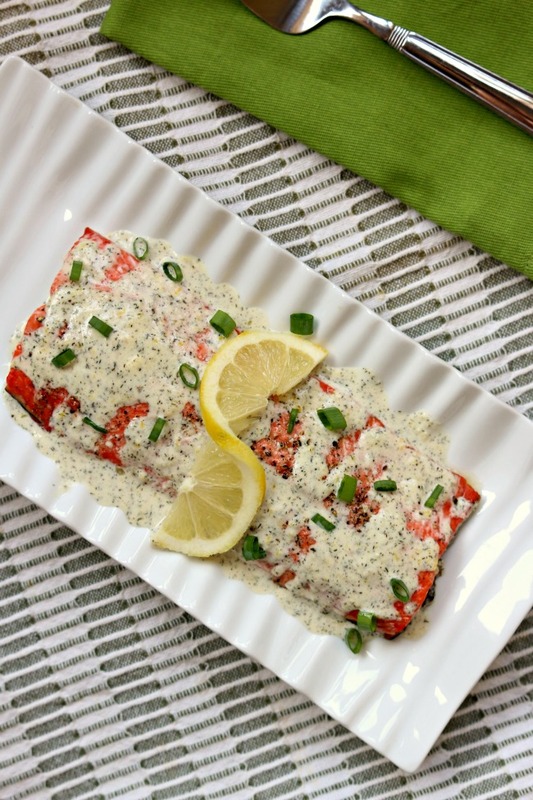 Like this recipe for Roasted Salmon with Creamy Garlic Lemon Sauce? Get all my new recipes delivered to your email inbox by signing up below. This was great, used fresh dill and made a little extra sauce so that it could be mixed into the rice and peas that I plated under the fish. Even the kids loved it. This is a good recipe idea, but honestly it’s really just an aioli with added lemon and dill . Frankly I would not add dried dill unless I had to, fresh dill would be infinitely better. While I appreciate the need for quick dinner ideas, anyone can take mayonnaise and tart it up. Overall this is rather pedestrian for a dedicated food site. Amazing !! so moist and delicious, easy to make and very taste ! it is so gooood. Does the sauce ever make it to the oven or do you pour it over the top cold? I just pour it over cold. I toyed with the idea of baking it on top of the salmon. I bet it would be good both ways!